West Bengal govt. invites WB Nijashree Housing Scheme online application form at wbhousing.gov.in for 1 BHK and 2 BHK flats to poor people. People from lower income group (LIG) having less than Rs. 15,000 income and middle income group (MIG) having less than Rs. 30,000 income can now apply online for WB Nijoshree Prokolpo housing scheme. The state govt. has allocated Rs. 3000 crore for construction of residential units. WB Nijashree scheme is applicable only for people whose monthly income does not exceed Rs. 30,000 per month. Initially, around 5000 flats would be distributed to LIG / MIG people in the next 2 to 3 years under Nijoshree Prokolpo Scheme. Interested candidates can apply online for Nijoshree Prokolpo Housing Scheme between 26 November 2018 to 31 December 2018. Residents of West Bengal from LIG category can apply online for 1 BHK flat with 378 sq.ft carpet area and priced at Rs. 7.82 lakh & people from MIG category can apply online for 2 BHK flats with 559 sq.ft carpet area priced at Rs. 9.26 lakh. Here candidates can fill all the details correctly and must attach the supporting documents. Applicants can collect and submit the application forms to bank branches for Nijashree between 26 November 2018 to 31 December 2018. 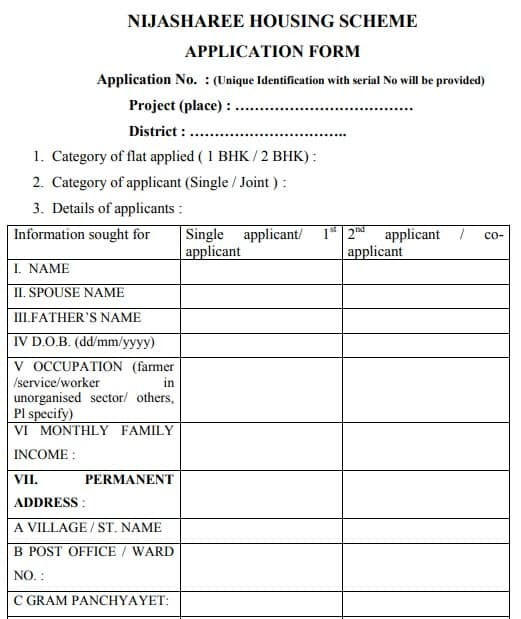 Candidates can also submit any other document as proof of address to apply for Nijashree Prokolpo housing scheme in West Bengal. The state govt. is providing new homes at lower rates after the success of Banglar Bari Awas yojana. Nijoshree Prokolpo Awas Yojana aims to provide flats to poor people who does not have monthly income to purchase their own flats. Candidates can also download the Nijashree Housing Scheme Advertisement and complete the Nijashree application process as mentioned above.